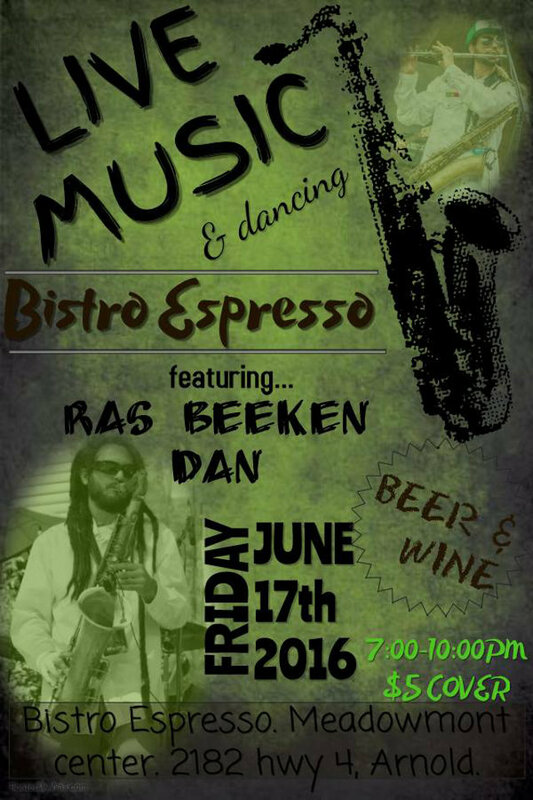 Ras Beeken Dan known as Beeken was born October 2, 1979, He comes from a musical family. His father was a singer and guitar/banjo player. His father sang a played rock,reggae, country, folk, blues and jazz. His mother is a vocalist...She sings lead and back-ups in church Choir..She sings gospel music also JAH muzik as well!!!!!!. My sister is also a singer. She sings pop, R & B and country. but she didn't feel music was her direction. He was the one to pursue his musical career. His mother signed him up for piano lessons when he was 5. At 6 years old his mother signed him up for dance. Also at that same time his uncle had an Alto saxophone that he use to play in school. He gave it to Beeken because Beeken was so fascinated by it. He loved the way it sound and how it looked. From that point on his musical journey took off. His father quickly signed him up for private lessons. From 6-13 years old he took lesson from The Late Great Matt Shoun. A famous Jazz composer and saxophonist in the San Francisco/Bay Area. Beeken's musical skills was ahead of everyone in his band class and other music classes. In 4th grade he was the 1st to do a solo with a piano accompinist for his 1st band concert. The song he chose was Pink Panther. It was a difficult piece. Beeken got a standing ovation. That's when he knew he was a saxophonist. At 11 he joined the jazz band and was in the advance band in school. He won awards for best solo in Jazz competition all over California and with the Ralston Junior School jazz band winning 1st place in the competitions most of the time. Going into high school Beeken received an award from Bill Clinton the President of the Uited States. For his musical achievements. That is a big thing for a 13 year old. Also receiving a music scholarship to one of the top private high schools in the bay area. At 15 year of age he transferred to a public school. His high school jazz band teacher introduced him to Tom E. Politzer. Lead tenor sax player for Tower Of Power. Right away Tom transformed Beeken into the sax player he is today. Beeken trained under Tom for 3 years. While training Beeken started a couple of bands Recorded his 1st album under Laughing Tiger Productions in San Rafeal, CA, The band was called T.H.C. Typical Hero Crew. Reggae, ska, and punk band from the bay area. Event occurs on 06/17/2016 from 07:00 PM to .